Total area: 75,000 sq. kms. The Diocese of Tiruvalla was extended from the river Pampa to the south to the river Ponnani in the north. It was on February 14, 1958 that the Holy See by the Decree Prot. 534/43, further extended the jurisdiction of the Diocese of Tiruvalla to the whole of Malabar Region of Kerala, the Civil Districts of Coimbatore, Nilgiris and Karur Taluk in Tiruchirapally Districts of Tamilnadu and the Districts of Mysore, Mandya, Hassan, Coorg, Chickmangalore, Shimoga and South Kanara in Karnataka. After the extension of the Dicoese, a few priests were sent to the new regions by His Excellency late Zacharias Mar Athanasios, the third Bishop of Tiruvalla. These pioneers of the Malabar Mission began to work zealously among the Malankara faithful, concentrating on a few centres like Bathery, Mananthavady, Nilambur, Edakkara, Karuvarakundu and Maikavu. In 1963 Mar Athanasios sent two priests to South Kanara (Karnataka) to work among the Malankara faithful who had migrted from Kerala. Desiring to establish the identity of the Malankara Catholic Church and to accelerate the Reunion Movement in the newly organized territories, His Excllency Zacharias Mar Athanasios requested the Holy See to bifurcate the Diocese of Tiruvalla and to erect a new Diocese with SulthanBathery as its headquarters. His Holiness Pope John Paul responded to the request and erected the new Diocese of Bathery on October 28, 1978 at Mar Theophilos Nagar (St. Thomas Malankara Catholic Church Campus, Thirumoolapuram) Tiruvalla, by His Grace Benedict Mar Gregorios, the Metropolitan Archbishop of Trivandrum and arch bishop of the Malankara Catholic Church. It was on February 2, 1979 that His Excellency Most Rev. Cyril Mar Baselios, the first Bishop of Bathery, officially took charge of the Diocese. The Enthronement (Sunthroniso) ceremony took place at the St. Thomas Pro-Cathedral at SulthanBathery. The existing 8,500 Malankara Catholics were organised in 43 Parishes and Mission Stations by zealous and committed priests of whom 18 belonged to the Diocese of Tiurvalla and 2 belonged to the Bethany Ashram. 13 Bethany Sisters and 17 Sisters of the Deena Sevanasabha also gave valuable services in different parts of the Diocese. After serious thoughts and prayerful reflection, it was concluded that the most urgent need in the Diocese was nothing but proper community formation both in its ecclesial and social sense. The Archdiocese of Trivandrum and the Diocese of Tiruvalla had generously given the services of some of their zealous and active priests. Thousands of families, besides some prominent priests came into the full communion of the Catholic Church. Many Parishes and Mission Stations were opened. Infact, many people from the Sister Churches requested the Diocese to start the Malankara Catholic Mission Stations in their locality. Mar Baselios instituted a few departments for the effective realization of the goals set by the Diocese. There were the departments of Cahtechetics, Youth, Family and Bible which were instituted in view of forming and uniting the whole people, namely, children, Youth Men and women, of the Diocese. The Diocese also gave due importance to its social commitment, taking seriously the life situation of the people around. The Diocese chalked out a social programme aimed at promoting the integral growth of men and women. The Social Service Centre, named Shreyas, which is the official organ of the Diocese of promoting justice and fellowship, is instituted in view of creating a more human and just society, based on Gospel values, through a scientific programme of mass education, mass mobilization and mass action. The Diocese also started few educational institutions under the Corporate Educational Agency of the Dicese to impart a value based education to the youth in the Diocese irrespective of caste and creed. After 17 years of inspiring leadership in the Diocese, His Excellency Mar Baselios left for Trivandrum on December 12, 1995 as he was appointed Metropolitan Archbishop of Trivandrum and the Head of the Malankara Catholic Church. His Grace Cyril Mar Baselios took charge of the Church and of the Archdiocese of Trivandrum on December 14, 1995. From December 14, 1995 till February 5, 1997 the Diocese was led by Msgr. Thomas Thannickakuzhy as its Aministrator. On December 18 1996 His Holiness Pope John Paul II appointed Very Rev. Dr. Varghese Ottathengil, the then Rector of St. Mary's Malankara Major Seminary, Trivandrum as the new Bishop of Bathery. Msgr. Varghese Ottathengil was consecrated a Bishop on February 5, 1996 at Mar Athanasios Nagar, Bathery (St. Joseph's School Ground) by His Grace Mar Baselios, the Head of the Malankara Catholic Church. Msgr. Mathew Nedungatt and Msgr. Thomas Thannickakuzhy served the Diocese as its Vicar General from 1980-82 and 1984 to 1998 respectively. The Diamond Jubilee of the Malankara Reunion Movement was celebrated in the Diocese of Bathery on 20, 21st September 1990 at Sulthan Bathery. Msgr. Thomas Cheruvupurayidom, Msgr. Issac Thottungal, Msgr. Eldho Puthenkandathil served as Vicar Generals during the period of 1998-2010. His Eminence Wladislao Cardinal Rubin, the former Prefect of the Congregation for the Oriental Churches visited the Diocese on January 9, 1981 and inaugurated the Pastoral Council and parish Senate in the Diocese. The Diocese of Bathery was blessed by the visit of His Eminence Simon D. Cardinal Lourdusamy, the then Prefect of the Congregation for the Oriental Churches on August 25, 1987. 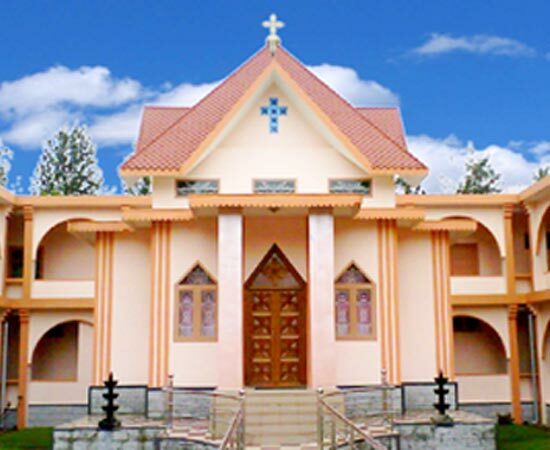 The Diocese of Bathery comprises the Civil Districts of Wayanad, Malapppuram, Kozhikode, Kannur and Kasargod of Kerala, Nilgiris of Tamil Nadu and Mysore, Mandya, Coorg, Hassan, Chickmangalore, South Kanara, Uduppi and Shimoga of the Karnataka State. Msgr. Issac Thottungal, the vicar General of the Bathery was appointed as Apostolic Visitor for North America and Europe and Auxiliary Bishop of the Archdiocese of Trivandrum on 18 June 2001, Archbishop of Tiruvalla on 15 May 2006 and Major Archbishop and Catholicos on March 2007. On 25 January 2010, as per the decision of the Holy Episcopal Synod, the diocese of Bathery is bifurcated and the eparchy of Puthoor is erected, consisting of the civil districts of Dekshina Karnataka, Chamrajnagar, Hassan, Chickmangalore, Mandya, Mysore, Shimoga and Uduppi Karnata state. Moran More Baseliose Cleemis the Major Arch Bishop and Catholicos transferred His Excellency Dr. Geevarghese Mar Divanassiose as the first bishop of the eparchy of the Puthoor. His Beatitude also transferred Most Rev. Dr. Joseph Mar Thomas, the auxiliary bishop of the Major Archdiocese of Trivandrum and the Apostolic visitor to North America and Europe, and appointed him as the third Bishop of Bathery. Moran Mor Baseliose Cleemis, installed His Excellency Dr. Joseph Mar Thomas as the Bishop of Bathery at St. Thomas Cathedral on 13 April 2010. His Excellency has constructed the new St. Thomas Cathedral and it was consecrated on 20th September 2016 by His Beatitude Cardinal Cleemis Catholicos. Msgr. Mathew Chamakalyil and Msgr. Varghese Thannickakuzhiyil served as the chief vicar general and vicar general of the eparchy from June 2010 to 2016 respectively. At present Very Rev. Msgr. Mathew Arambankudiyil serves as the Chief Vicar General and Very Rev. Msgr. Thomas Kanjiramukalil functions as the Vicar General. Besides, the eparchy has got five Cor-Episcopos and two Episcopal Vicars to guide the pastoral ministry of the eparchy. Eparchy of Bathery has started three new Higher Education Institutions and several school for educational apostolate during the period of 2012-2014. The eparchy has got 109 parishes, vibrant Malankara Catholic Association (MCA), dynamic youth(MCYM) committed Women Centered ministry(Mathru Jyothis). Commendable catechetical programs and social development activities are conducted by Sreyas. Priests from the Eparchy of Bathery serve in the mission diocese of Gurgeon, Kadkki, Jamaica, Gulf regions, Europe, USA, Britain, Ireland and Scotland. There are 101 priests of the diocesan clergy, eight priests from Bethany Ashram and three priests from fathers of faith congregation, who render their dedicated service in the mission eparchy of Bathery. Sisters from Bethany Congregation, Daughters of Mary, Deena Seva Sabha, Holy Spirit and Sisters of Franciscan missionary congregation are also giving their great services in the eparchy.